This months post is being filed after the event.. a vacation en famille around Europe with a Kia. Will keep it short and sweet. ..so 3 points of reference.. 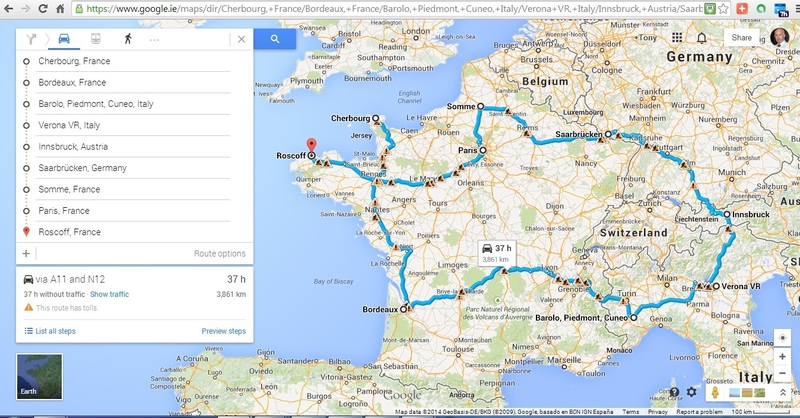 This Google Map gives a sense of the trip… a great adventure. Thankfully travelling since the advent of the Internet, ATMs, the EU, the Euro, modern motorways, Google, GPS/SatNav etc has made it much easier than ever before in the past. Europe remains perhaps the most fortunate continent on earth.. rich in history, art, architecture, good food and wine… yet diverse enough to always stimulate with differing landscapes, language, culture and road signage along the way..
20 years ago this would have been a much greater ordeal..
100 years ago it would have been unthinkable.